When was the last time you used a phone booth? 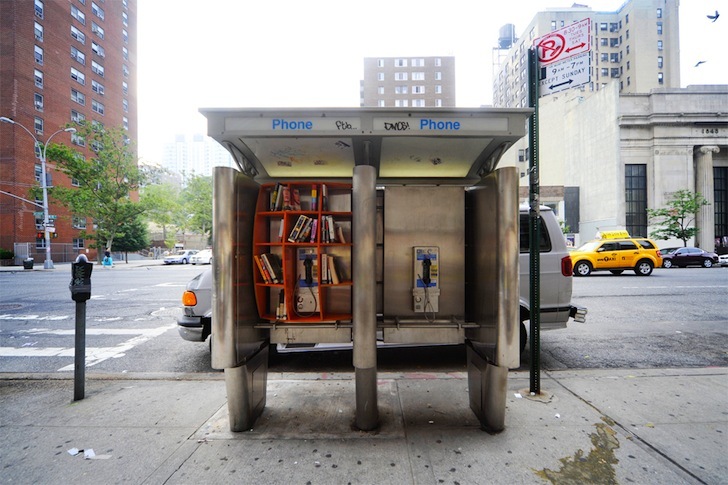 Despite cell phones being as common as clothing, rarely-used metal phones booths still exist throughout New York City, but architect <a href="http://gracefulspoon.com/" target="_blank">John Locke</a> has created a clever way to give them new life. 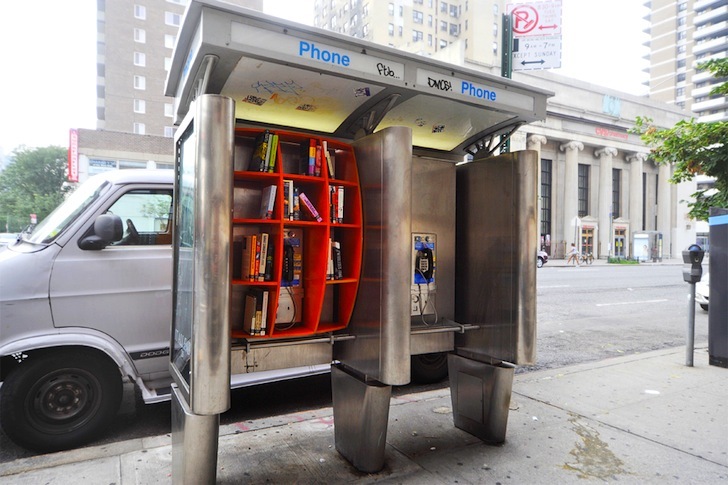 Locke attached a pumpkin-orange set of shelves to an obsolete phone booth near 96th Street to create a mini, ultra-public library. Made out of plywood milled by <a href="http://www.kontraptionist.com/">Kontraptionist</a> and stocked with books donated by local residents, <a href="http://gracefulspoon.com/blog/2011/07/06/dub-002/" target="_blank">Dub 002</a> is the designer's second attempt to create a free book distribution system sans any kind of prescriptive rules. 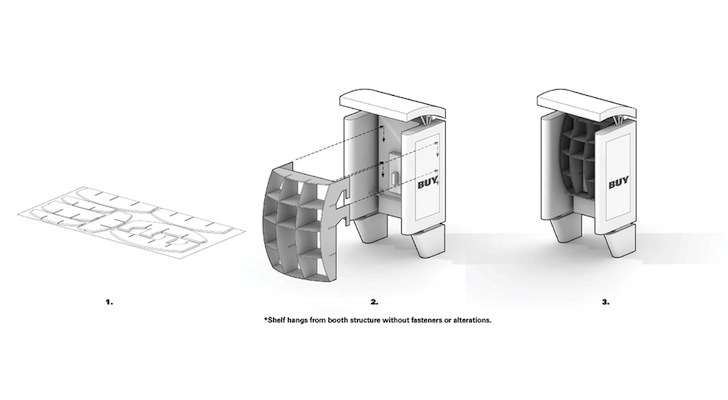 His goal is to reinvent the obsolete phone booth as a <a href="https://inhabitat.com/tag/public-space-nyc/">new kind of public space</a>. The first <a href="http://www.inhabitatshop.com/Oeuf-Mini-Library-Storage.html">mini-library</a> was installed on a phone booth eight blocks further north in a rather desolate area that has little foot traffic. The books in the first library disappeared within six hours and the plywood shelf within just ten days. In order to counter this, Locke chose a much more conspicuous location near an express train stop on Broadway and put a visible logo on the bottom of each book's spine. The shelf itself is completely detachable. The new library hasn't been vandalized, but Locke believes that the logo makes passersby reluctant to leave with the book and return with another one, which is the idea - to create an egalitarian <a href="http://en.wikipedia.org/wiki/Bookshare">book-sharing system</a> for the city. He writes on Graceful Spoon, "I intentionally wanted to avoid any directions...but after seeing people hesitate when confronted with 002, perhaps there is a more subtle way to gently describe an intended use." The libraries are part of Locke's urban intervention project call the <a href="http://dubnewyork.org/" target="_blank">Department of Urban Betterment</a> (thus, DUB). 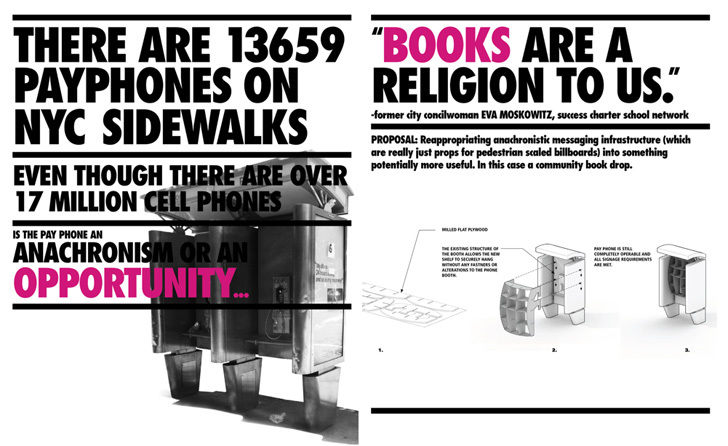 Locke created several promotional posters advertising the phone booth libraries. When was the last time you used a phone booth? 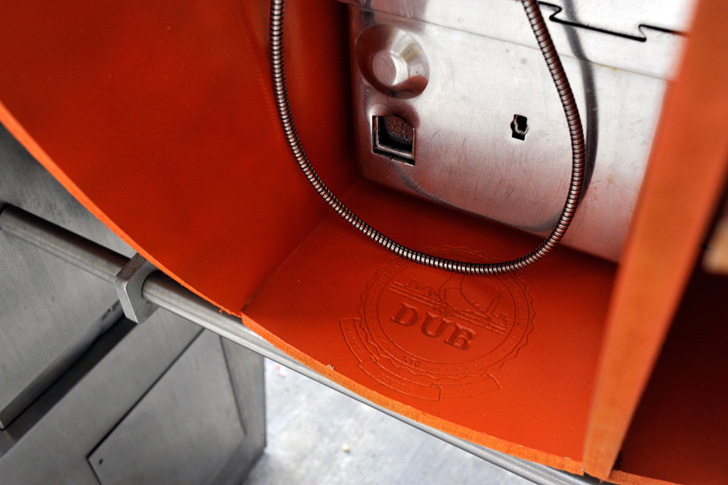 Despite cell phones being as common as clothing, rarely-used metal phones booths still exist throughout New York City, but architect John Locke has created a clever way to give them new life. 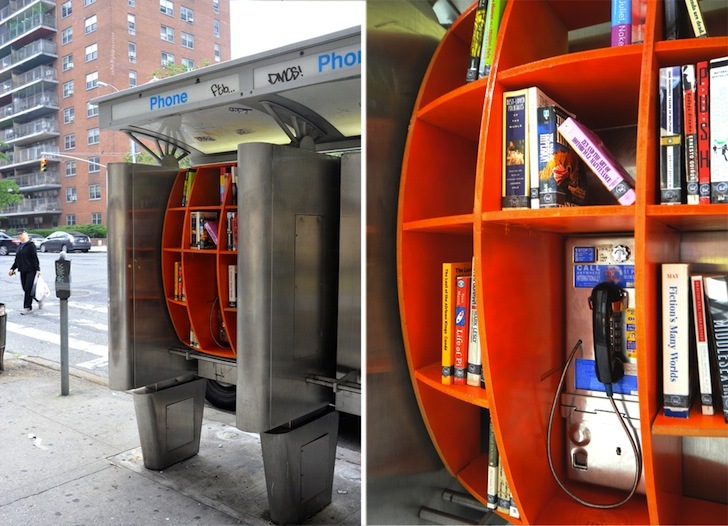 Locke attached a pumpkin-orange set of shelves to an obsolete phone booth near 96th Street to create a mini, ultra-public library. Made out of plywood milled by Kontraptionist and stocked with books donated by local residents, Dub 002 is the designer's second attempt to create a free book distribution system sans any kind of prescriptive rules. 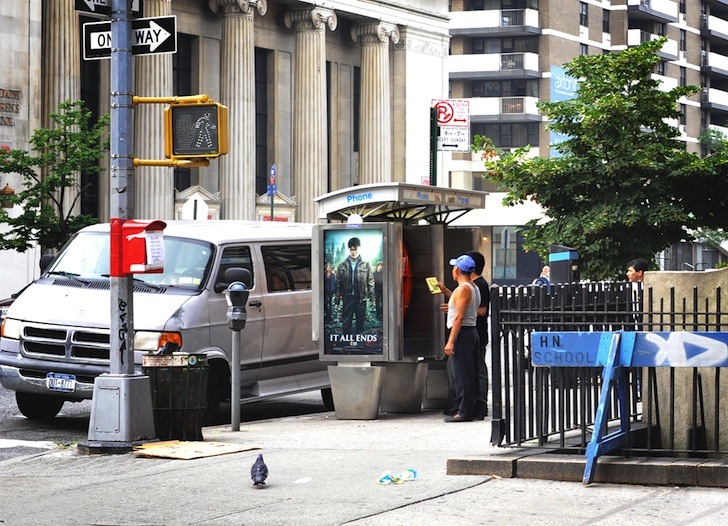 His goal is to reinvent the obsolete phone booth as a new kind of public space.